Heads of state, high-ranking economic experts and business leaders came together at the World Economic Forum’s annual meeting in Davos, Switzerland, to exchange views and opinions. Amid concerns about the Chinese-US trade war, Brexit and a looming economic downturn, this year’s WEF meeting saw numerous calls for increased international cooperation. The International Monetary Fund (IMF) opened the meeting prominently, warning in its “World Economic Outlook” about an impending downturn of the world economy. Against the background of the trade dispute and other uncertainties, the outlook for the global economy has dimmed somewhat, the current IMF forecast finds. 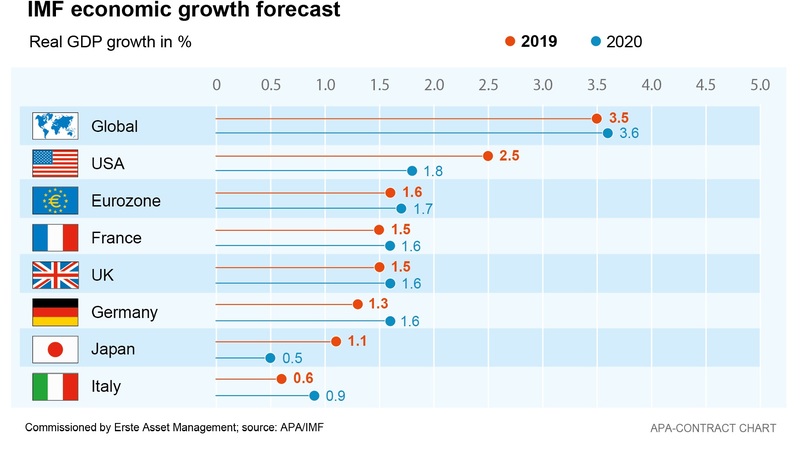 The global GDP growth estimate has been reduced to 3.5 per cent this year and 3.6 percent for 2020, where the forecasts still lay at 3.7 per cent respectively in October. “The slowdown seems to be coming sooner than expected,” IMF Deputy Managing Director David Lipton told Reuters TV. While the economy is still doing well, there are numerous risks, ranging from trade disputes to poorer financing conditions, Lipton said. Against this background, several heads of state called for increased international cooperation and a renunciation of protectionism in Davos. Germany’s Chancellor Angela Merkel called for further free trade agreements, explaining that she is seeking allies for multilateralism: “Anything else would lead to misery,” Merkel emphasised, adding that she would like to see a reform of the major international organisations to reflect the massively increased influence of economies such as China or India. Japan, which currently heads the group of the 20 largest industrialised and emerging countries (G-20), also spoke out in favour of strengthening the multilateral order. “Japan is determined to maintain and develop free, open and rule-based international order,” Prime Minister Shinzo Abe declared at the WEF. Without naming the US, Abe called for confidence in the international trade regime to be restored. The World Trade Organization (WTO) has an important role to play as the guardian of free trade. However, US President Donald Trump, seeing his country badly treated by the WTO, went as far as to threaten the US’s resignation. China’s Vice President Wang Qishan sees international trade regime seriously endangered, criticising that many countries were looking inwards more and more, putting a damper on international trade and investment, while unilateralism, protectionism and populism are increasing. Wang described economic globalisation as an “inevitable trend”. Wang emphasised the enormous potential utilizable, if the individual countries’ competitive advantages were exploited and economic ties strengthened. In response to the challenges facing the world, he declared that countries must take this course of action jointly and actively. Wang made no mention of the ongoing trade war with the USA in his speech. A scheduled meeting in Davos to discuss the trade conflict with US President Trump was not held due to Trump’s cancellation at short notice. However, Trump’s was not the only prominent cancellation: France’s President Emmanuel Macron and UK Prime Minister Theresa May also did not attend the WEF this year due to domestic political problems. Austria was represented by Federal Chancellor Sebastian Kurz and Foreign Minister Karin Kneissl.